Henderson Directories. 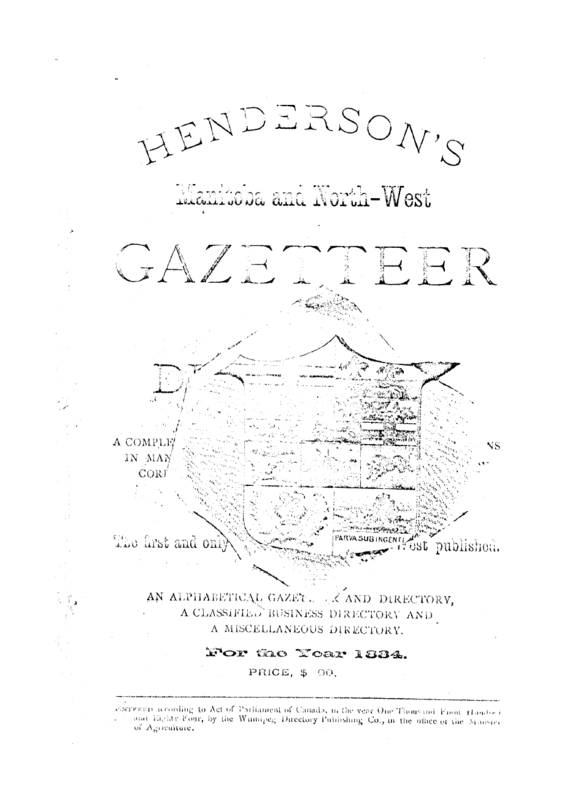 Henderson's Manitoba and Northwest Territories gazetteer and directory. Winnipeg: Henderson Directory Co, 1878-1905. Annual. Title varies greatly, including, Henderson's Manitoba and North-West gazetteer and directory: …the first and only gazetteer of the North-West published, containing an alphabetical gazetteer and directory, a classified business directory and a miscellaneous directory, for the year 1884 ; Henderson's Manitoba and North-Western Ontario and Northwest towns and City of Winnipeg directory: A complete directory…for the year 1886-87 ; Henderson's Manitoba and Northwest Territories gazetteer and directory for 1892 ; Henderson's Manitoba and Northwest gazetteer and directory , 1905, which included Manitoba, Alberta, Saskatchewan, Western Ontario, eastern British Columbia, and a business directory for the City of Winnipeg; and Henderson's Western Canada gazetteer and directory , 1907-1908. Publisher name also varies. See also Peel 921.